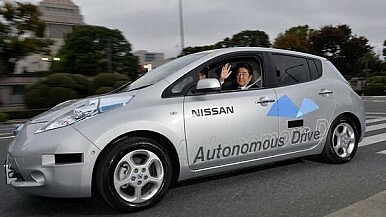 Shinzo Abe rode in three self-driving cars from leading Japanese automakers. In September, the Japanese government issued its first license for an autonomous vehicle, giving an official nod for the futuristic technology to be tested on the country’s public roads. Over the weekend, Japanese Prime Minister Shinzo Abe became one of the first people to experience being chauffeured around Tokyo in self-driving cars from three of Japan’s leading auto manufacturers: Nissan, Toyota and Honda. Self-driving and environmentally friendly technologies are expected to be centerpieces of the expo, with Nissan’s all-electric Leaf prototype serving as a prime example of the two concepts working in harmony. The automaker – which partnered with MIT, Stanford and the University of Tokyo – pledged to bring “affordable” auto-piloting cars to the market by 2020. “I felt with my body that the Japanese technology is the world's best,” Abe told members of the press after being driven on roads around the National Diet Building. Japan faces intense competition from U.S. and European automakers, who are also in a race to deliver auto-piloting vehicles to consumers. Mercedes-Benz, in a partnership with Nokia, already completed a 100 km public road test of its own self-driving luxury car back in August. Google’s driverless cars have been tackling the streets of Nevada since last year. While Nissan has set a 2020 deadline for its own consumer-ready smart car – Tesla Motors CEO Elon Musk said that his version will be ready for the road in less than three years. One town in the U.K is also planning to implement autonomous shuttles from 2015. The issue of insurance liability if a self-driving car is involved in an accident is perhaps the biggest hurdle to getting consumers behind the wheel. “We have to find new regulations – how to take care of accidents, if they happen, whose responsibility it will be,” said Takao Asami, Nissan’s senior vice president. The company has committed itself to a “Zero Emission, Zero Fatality” policy as its Autonomous Drive prototype begins public road trials. While Japanese roads may be a useful proving ground for the advancement of self-driving technology, the same cannot be said for the rest of Asia or the world. A recent survey by Carinsurance.com found that 20 percent of American drivers would prefer to commute to work in a self-driving car. It also found that 90 percent of respondents would consider an autonomous vehicle if it resulted in a lower insurance premium. For those hoping to catch a sneak peak of Japan’s driverless cars, the Tokyo Motor Show will open in Odaiba on November 22 and run through December 1.